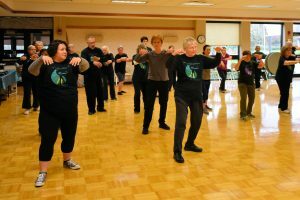 Lathrem Senior Center held the 2018 World Tai Chi Day in Kettering, Ohio. As dawn broke on this long-awaited day, Saturday, April 28, 2018, the skies appeared to be clearing and weather welcoming. We had high hopes of celebrating this world movement outside among the natural beauty of the grounds of the Kettering Recreational Complex in Kettering Ohio. As the hour approached the clouds thickened and a cold breeze started to blow. There was a bit of a chill coming off of the small lake next to the area we were going to play. With the participates comfort and wellbeing in mind we decided to move the event inside to the Lathern Senior center A/B combined rooms. This would be the fifth year in a row that we had to move inside due to the weather. Maybe next year we will be outside. The combined room was warm, dark and almost empty, with the exception of several chairs and tables. We enlisted the aid of few of the TAMA Tai Chi Students to help set up and get the rooms ready to receive our guest. The Welcoming table was a position just inside the front doors of the A/B room. 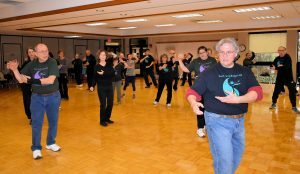 We offered past year World Tai Chi and Qigong Day tee shirts, little trinkets and information on Tai Chi and its health benefits. We also encourage everyone to sign our “Sign In Sheet” so that we can get a census of who attended the event. We had over 40 people sign in for this event. Not our best year, but not our worst either. Before the official start of 2018 World Tai Chi Day in Kettering, Ohio at 10 am EST ( Each event is held at 10 am in their local time zones around the world. ) we gave a brief overview of the World Tai Chi and Qigong Day movement and what it means. Noting its humble beginning with Bill Douglas in Kansas City 16 plus years ago and how it has grown to over 100 cities in 80 countries around the world. ( http://www.worldtaichiday.org/ ) We then gave Special Thanks to the staff at the Kettering Recreation Complex, volunteers and our Master instructor Manuel Taningco of TAMA Martial Arts. The instructors and several advanced students proceeded to do various demonstrations starting with the Universal Yang 24 movement form. The “Universal Yang 24 movement Form” was created by Yang Taiji Masters from around the world to serve as the “common” form that competitors can be judged against. The players executed the form quite well, but we did have a few glitches here and there. I think it was due to nerves because we almost did it perfectly the night before in practice. I also think environmental orientation did play part in the glitches. 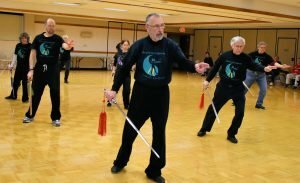 The next weapon form demonstrated was the Taiji Long Staff. This is an uncommon Tai Chi form, with emphasis on the circular movements and the use of the full length of the staff. Next was a fan favorite, pun intended. Hu Die Shan ( Butterfly Fan Form ). This form is a favorite because of its sweeping movements and load cracks when the fans are opened with force. The last form to be demonstrated was the Taiji Yang Jian ( Yang Straight Sword ) The straight sword is normally the second weapon that a student learns once they completed the Yang long form. The straight sword becomes an extension of the user and projects their energy out from the center. Once the demonstrations were complete we informed the audience that our Master ( Manuel Taningco ) will be giving a seminar on the Taiji Yang Jian on June 16th and that anyone can participate that has some weapon knowledge, or if they want to refine their skills. At this time we invited the audience to participate in several Qigongs and to explore the “Big Frame” Yang Long form. We started with a “Yawn” , it is the body’s natural way of relieving stress. Plus several people have not woken up yet. Now we have a good foundation to begin our journey. We started with the “Ba Duan Jin” ( 8 Pieces of Brocades ) to get the body moving and stretched out. It generates lots of energy and promotes good health and mental alertness. I normally break a sweat doing them, as Qi flows. We decided to have a bit of fun and generate more energy with the “Cosmic Vessel” Qigong. This Qigong brought back a lot of childhood memories playing with a Hula-Hoop. Now that everyone is well oxygenated and relaxed we separated the audience into three groups. Beginners and people who have never done Tai Chi, intermediates for those that have just started learning and the Advance players for those that know the whole form. A brief definition of the “Big Frame” Yang long form was given so that the audience would understand the sweeping and flowing motions better. 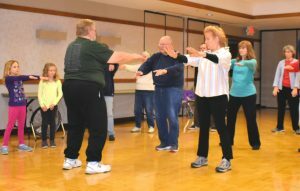 With all of these levels of Tai Chi, the rooms became small and energized with the Qi of the participants. After an hour or so of doing the form and instructions, the event started to whine down. A lot of the participants express their joy and how good they feel. We told them that is Tai Chi. We expressed to them that learning Tai Chi ( Taiji ) is like opening the “Owner’s Manual” to your body and finding out what it can do. Unfortunately, we stiffen as we get older and we forgot how to relax and to have fun. We then briefly answered questions and gave some specialized instructions to those that requested it. And, before everyone departed for the event, we gathered the group together for a picture to commemorate the event. Once all the pictures were done we Thanked everyone for coming and encouraged every to seek out Tai Chi classes and keep next year’s 2019 WTCQD event in mind. 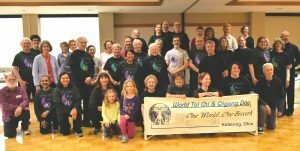 Overall this event of 2018 World Tai Chi Day in Kettering, Ohio was successful, the audience got a glimpse of what Taiji can do, and how it can be used to gain better health and a sense of wellbeing. It is now up to them to find the path and journey forth to a better self.